When construction for a new parking lot at the Profile Trail at Grandfather Mountain State Park was scheduled for spring 2016, Sue McBean, Superintendent at the State Park, asked for help in rescuing plants from the bulldozers at the planned construction site. This turned into a team effort with a number of local groups and individuals involved on multiple dates between March 17 and April 2, 2016. Mark Rose, Chair of the Blue Ridge Chapter of the NC Native Plant Society, arranged for the necessary permits, and members of our chapter as well as botany students from Appalachian State University, Master Gardeners, and other volunteers helped dig up plants under the supervision of State Park rangers. 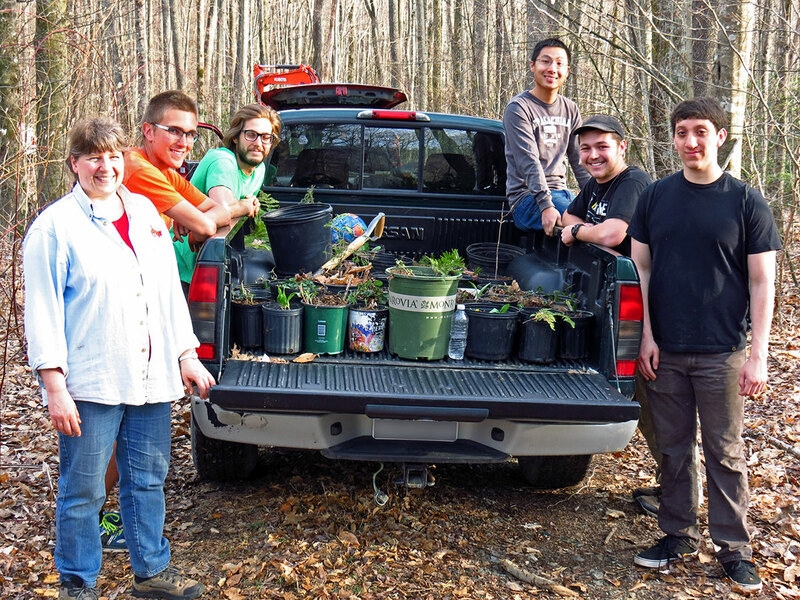 Students from the botany class and their instructor Dr. Annkatrin Rose from Appalachian State University helped with identifying, digging, moving and replanting of rescued plants. Here's a load ready to go to the Daniel Boone Native Gardens for transplanting. The courtyard at the Biology Greenhouse at Appalachian State University was used as a holding area for plants that could not immediately be replanted. 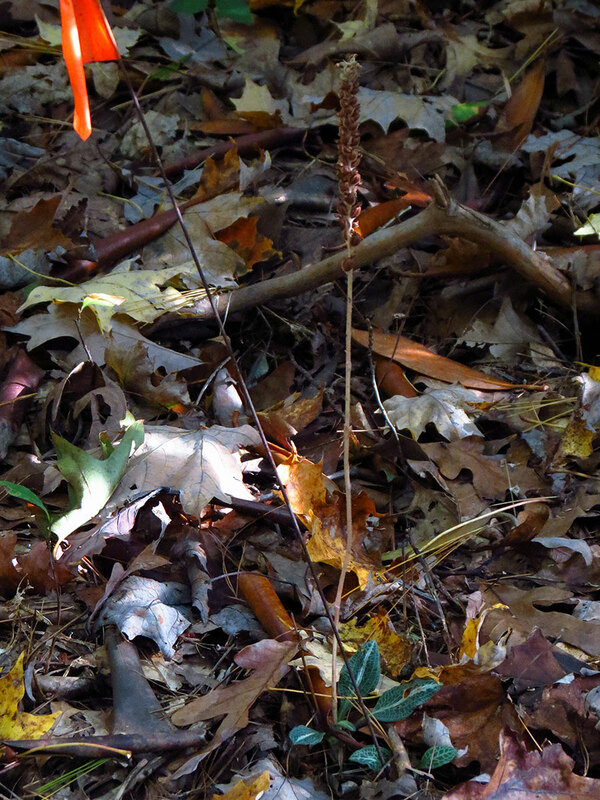 We found a lot of Downy Rattlesnake Plantain (Goodyera pubescens) thanks to the fact that its foliage is wintergreen. 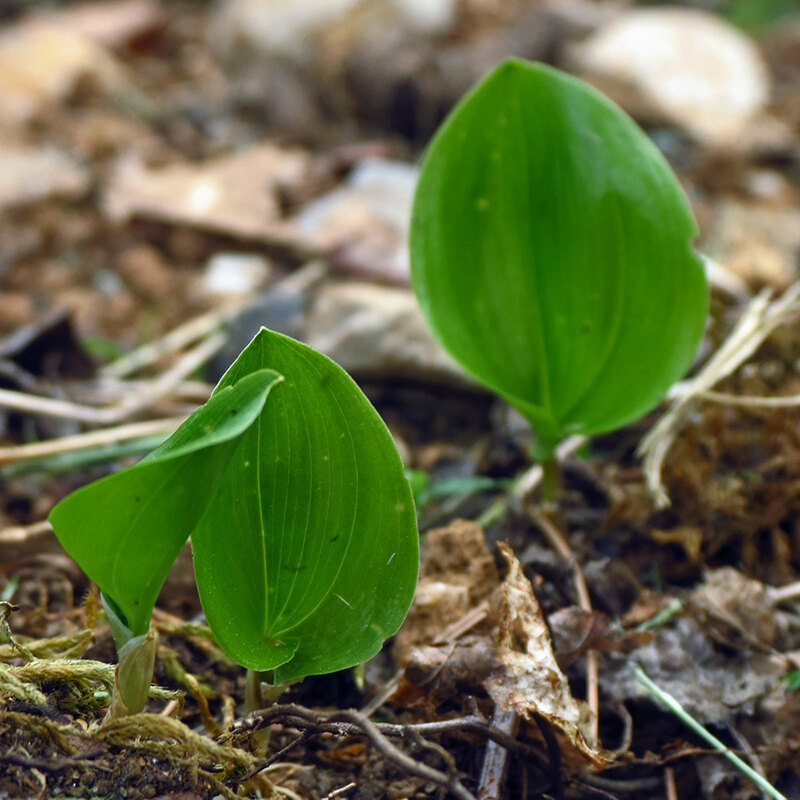 Some plants such as orchids and lycophytes can be difficult to transplant successfully because they need their mycorrhizal partners for survival. We tried to take a good chunk of the surrounding soil with these plants and placed them into environments with similar tree species composition as the original site. 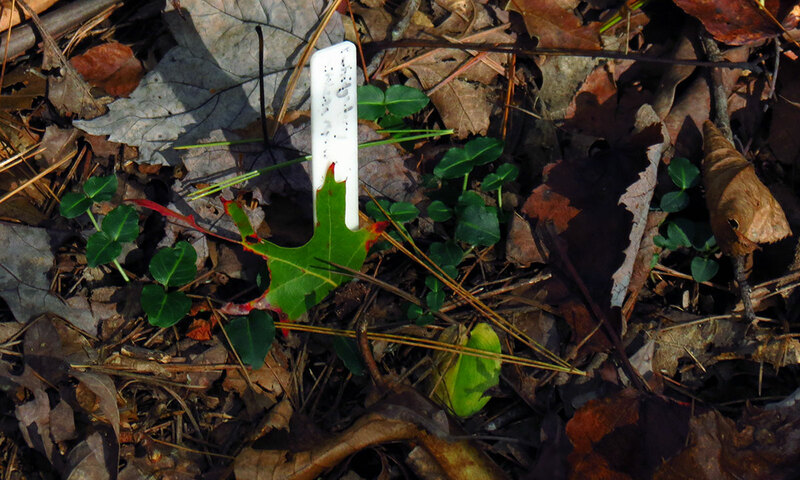 For many of the plants, their new home was the wooded area of the Daniel Boone Native Gardens that offered a similar environment to the deciduous forest that the rescued plants came from. Because the rescue happened so early in the year, only the very first spring ephemerals were identifiable yet. Plant #105 was a sprout that looked interesting but we weren't sure what it was when we dug it up. It turned out to be Appalachian Bunchflower (Veratrum parviflorum). 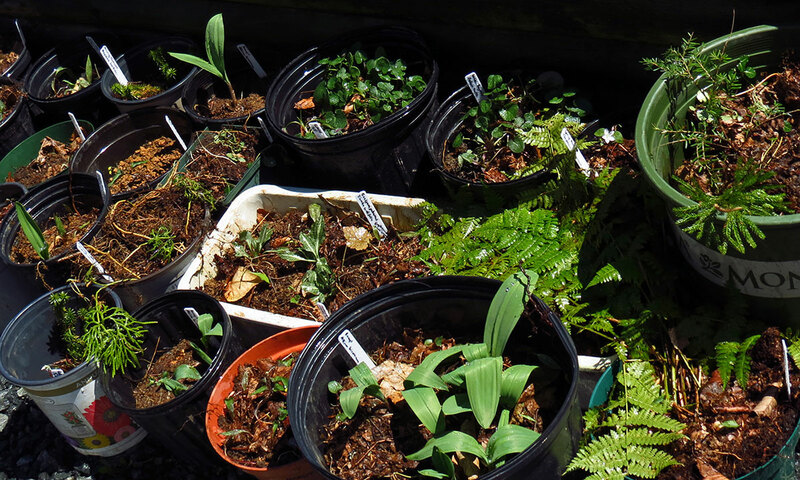 Since we couldn't see many of the plants yet, we also transferred whole flats of soil in hopes that they contained spring ephemerals and seeds that would emerge over time. To help the plants settle in, we placed leaf litter on top of them after planting. 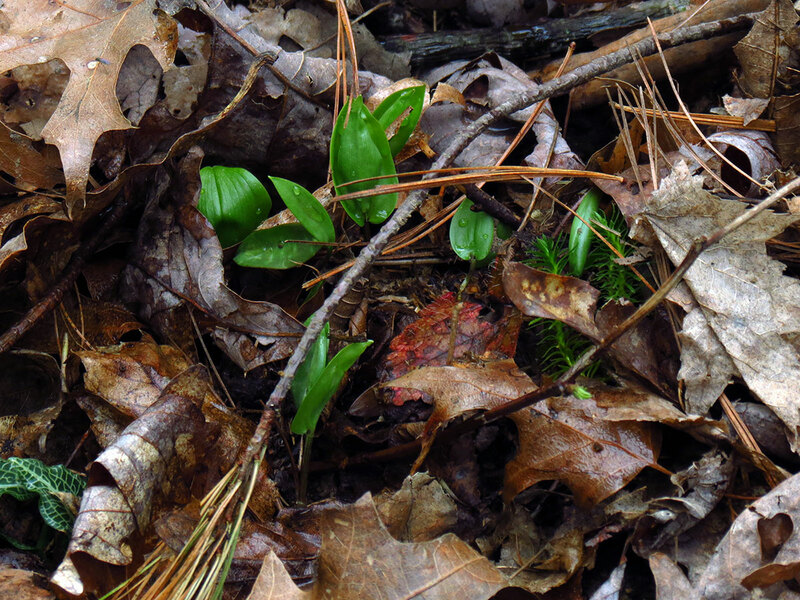 This patch obviously contained Shining Clubmoss (Huperzia lucidula) and a Downy Rattlesnake Plantain (Goodyera pubescens) but the Canada Mayflowers (Maianthemum canadense) were a welcome surprise hiding in the soil. The true test whether a transplanted wildflower "made it" is whether it is thriving a year later or not. The following images were all taken at least one year after the initial rescue, providing evidence that the plants successfully settled into their new environment. 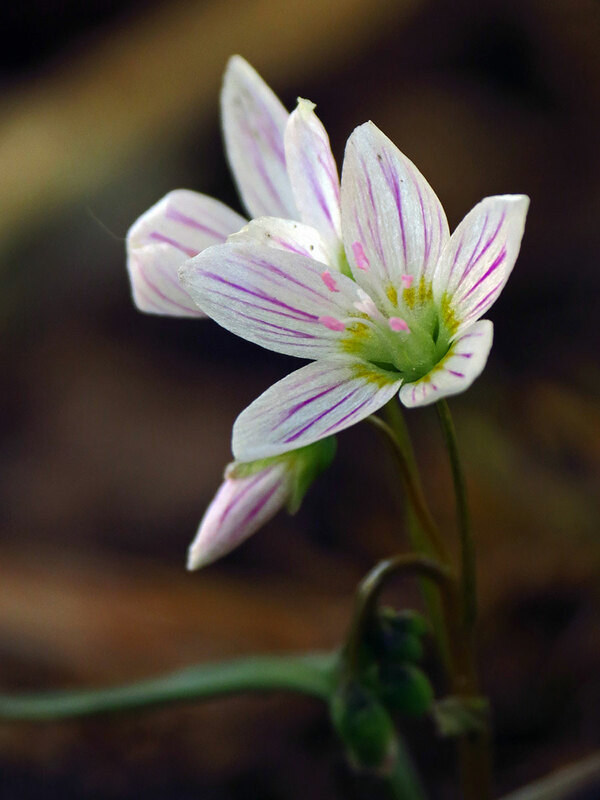 The spring ephemerals such as this Spring Beauty (Claytonia caroliniana) were the first to emerge. 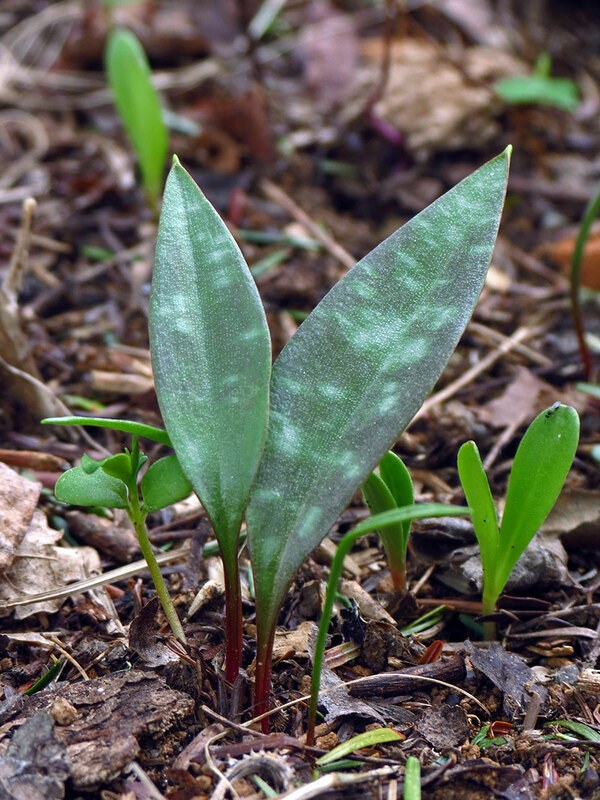 Almost all the soil we transferred had Trout Lilies (Erythronium americanum) in it. They were back again one year later as well. 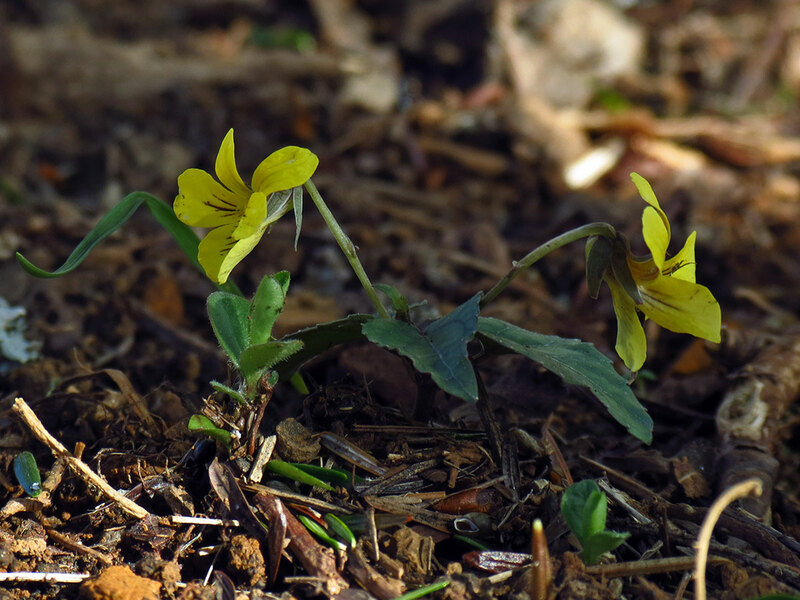 We had dug plenty of Halberd-leaved Yellow Violets (Viola hastata) because these were some of the only flowers up yet at the time of the rescue so they were easy to find. They were back again the next year, too. 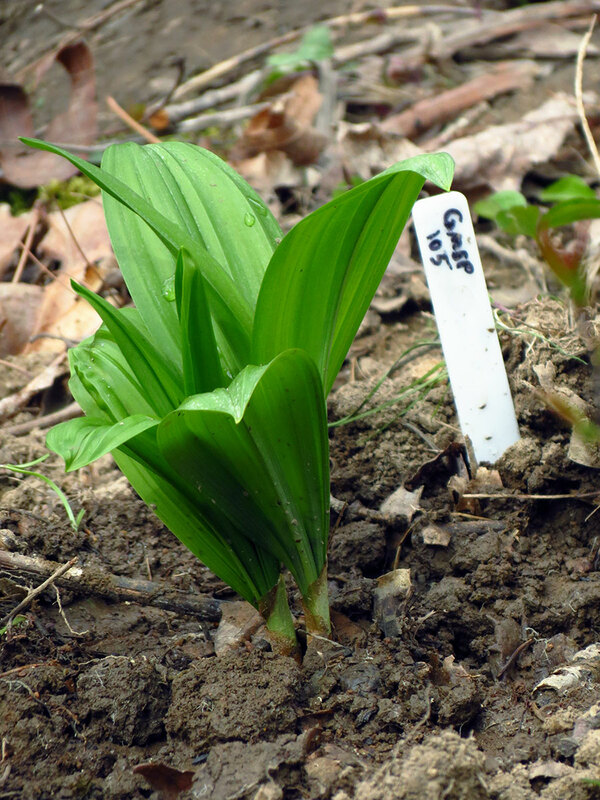 The rhizomes of Canada Mayflowers (Maianthemum canadense) were hiding in pretty much every pot of soil transferred, so they were back the following year as well. 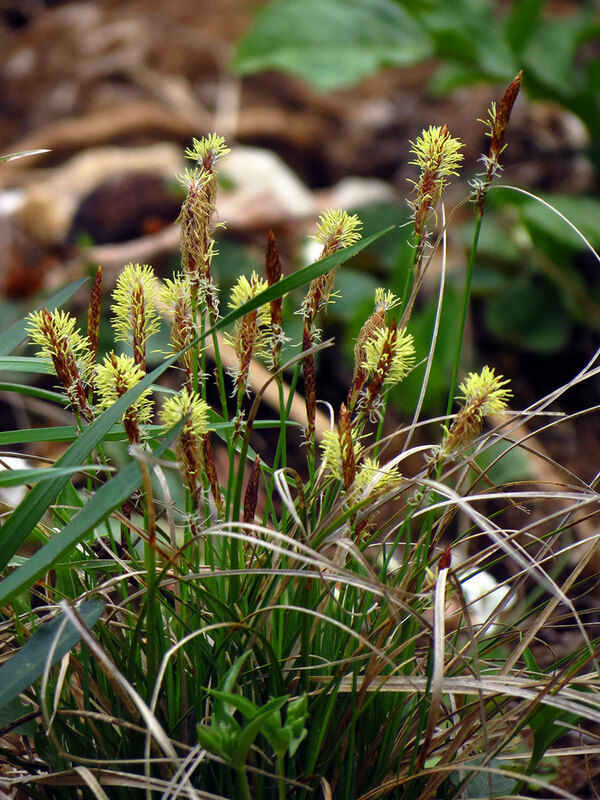 Pennsylvania Sedge (Carex pensylvanica) was not only back but looking to be positively thriving in its new location. 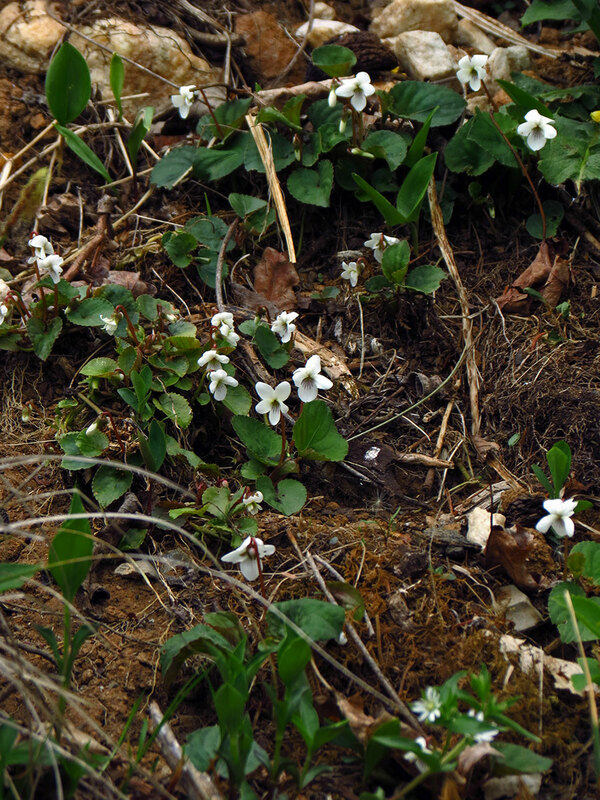 This patch of transferred soil apparently contained an entire colony of Sweet White Violets (Viola blanda). Only a few of them came up the year of the rescue, but they were ready to show off the following year. 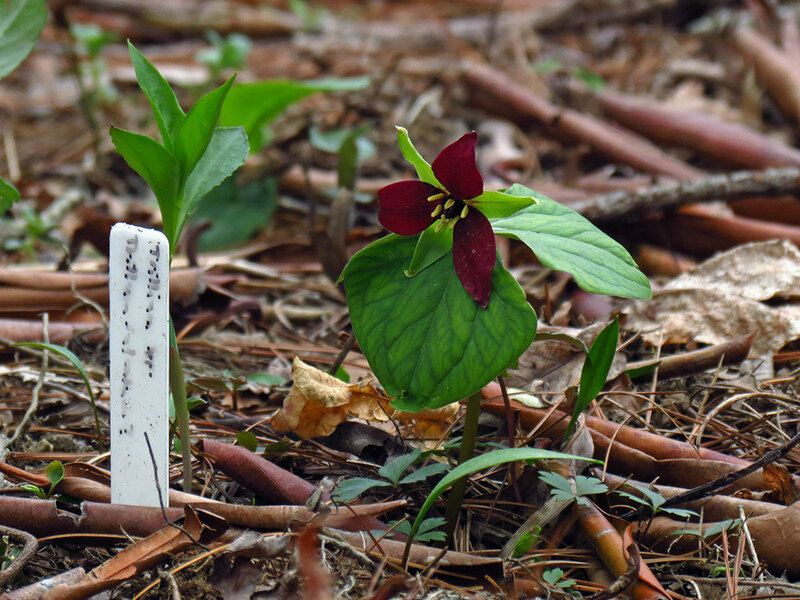 This Southern Red Trillium (Trillium sulcatum) had its flower and leaves chewed off by a deer just after it emerged following the rescue and we were worried that it wouldn't have the energy to come back. But here it was, back again a year later and blooming nicely! 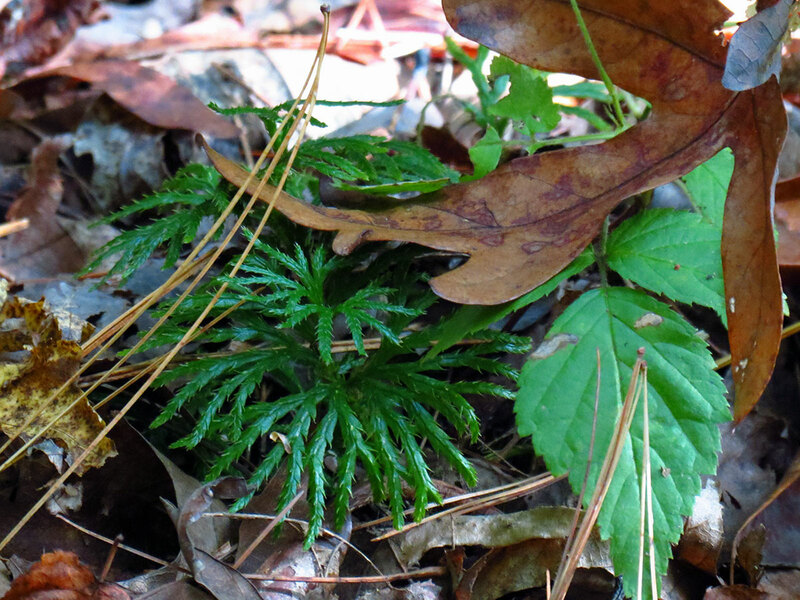 Lycophytes can be hard to transplant and some of the ones we transferred did not survive, but several patches of this Running Cedar (Diphasiastrum digitatum) as well as the Shining Clubmoss (Huperzia lucidula) were still thriving a year later. 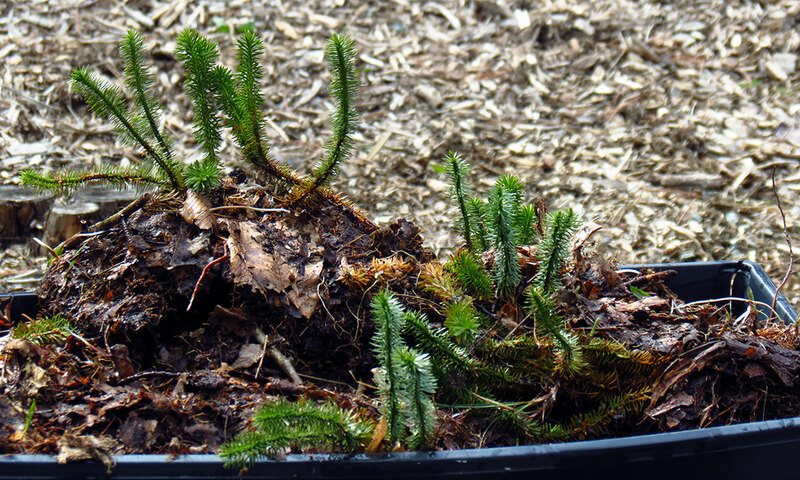 One of the clubmoss patches actually had started making spores by the second fall after the rescue. Since the rescue was before most spring and summer flowers emerge, we targeted a lot of evergreens, such as this Partridgeberry (Mitchella repens). It was still doing well a year later. Our labels were starting to wear off though. 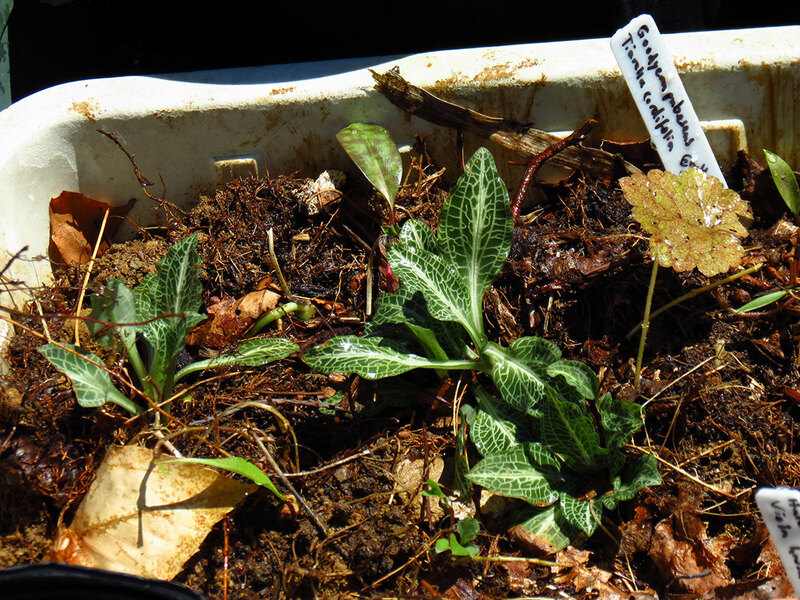 Almost all of the Downy Rattlesnake Plantains (Goodyera pubesens) that we transferred were still doing well a year later. As a matter of fact, this one had bloomed the summer after the rescue. 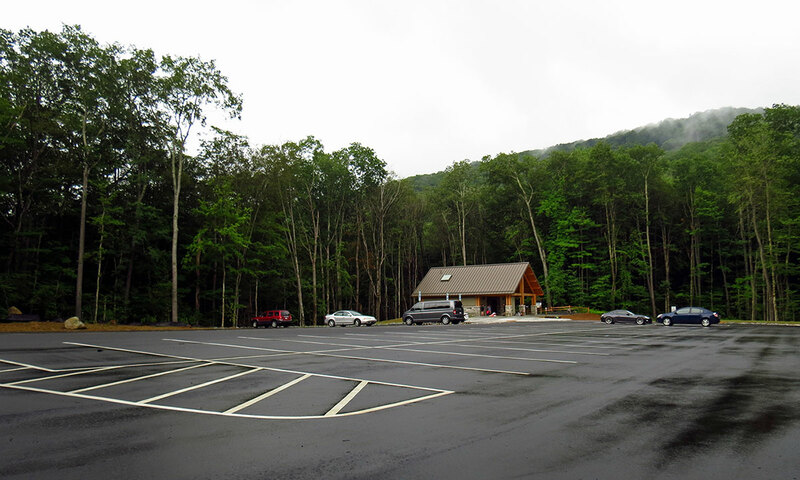 The new Profile Trail parking lot opened to the public just in time for the July 4th Holiday in 2017. This is the area that most of the rescued plants came from. There is now room for 100 cars, bathroom facilities, and the trail was extended to connect to the parking lot. While some of the rescued plants went to home gardens of members involved in the rescue, many were used in public areas. 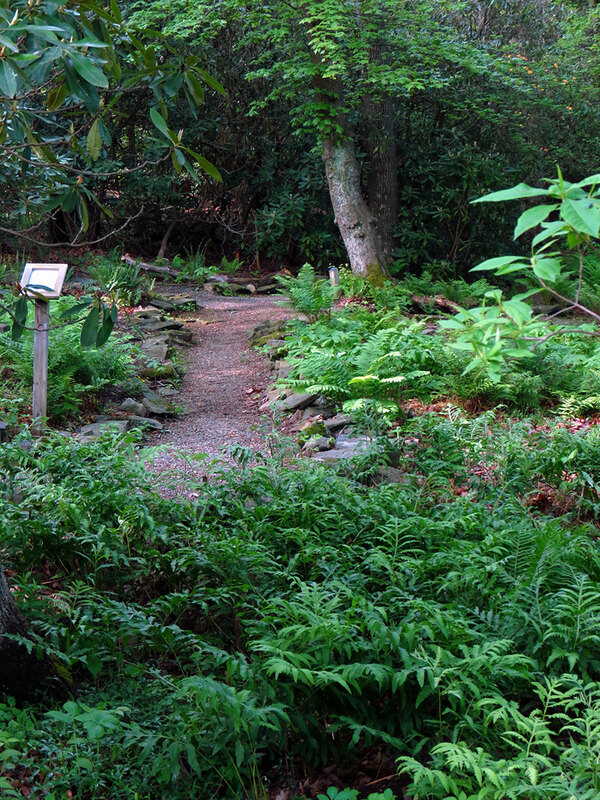 Over 100 containers with rescued plants were transferred to the Daniel Boone Native Gardens to enhance the Fern Garden and Rhododendron Walk, which present a natural woodland setting that these plants thrive in. Others were used in stream bank restoration projects or replanted around the new Profile Trail parking lot after construction was finished.